Been in a crazy ups and downs as how life always does it. Deep down, I know the good times will come, a moment when you seek comfort in new good reads. I do. This month to early week of March, I will spend my precious yet short free time with these three books. I've decided not just to read it but also review them. Talking about good books really do the magic. So, I have Titik Nol by Agustinus Wibowo. It's been months and almost a year maybe. I haven't completely finished reading it. There's been another books get into my urgent status to read on. Now, I shouldn't let anything on my way to read it thoroughly. Crossing my fingers! 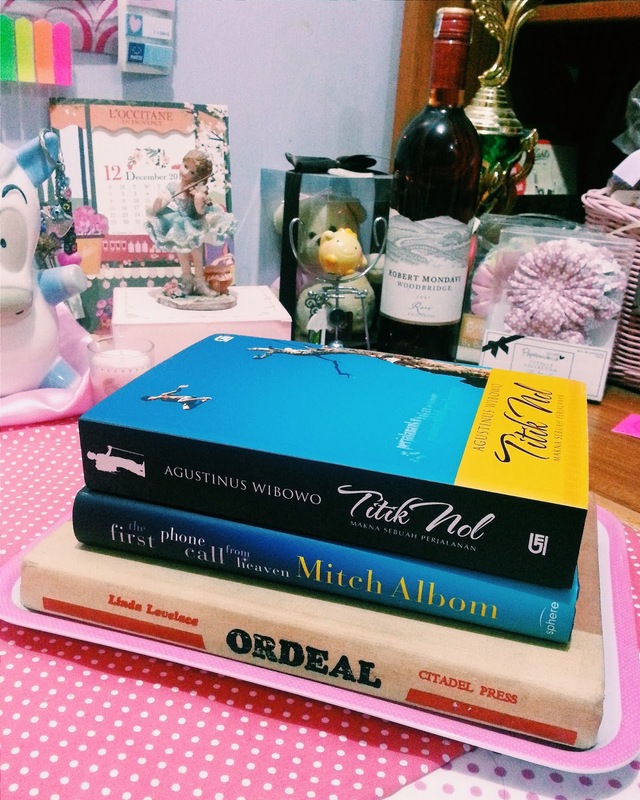 After that, I plan to read the book I've been waiting for.... it's from... Mitch Albom! I'm super excited. Celebrate it with a selfie! The author has been my favorite since high school. Ever since, Five People You Meet In Heaven for exact. I had all book of his and they are in special spot of my bookshelf. Hopefully this one will not get me crying all along the pages. It's what his books always do to me. I'm such a tearjerker. Well, anyway, the last one is...another blessing that pays a visit. A friend from bookblogger group gave me the book by Linda Lovelace, Ordeal, for free! She even sent it to my home. How generous! It's an old book...quite a rare print to add into my collection. By the way, my birthday is in March and I will have another giveaway with good books in it and cool things attached. Wait for the next post, okay? I hope you'd like to read my reviews on these three gems, too. Bye! P.S. : I'm in the mood for this song. At least, it's a 'appropriate' song to sing along (or just to listen to) when you're tidying up your bookshelf or even when you're updating your goodreads shelf account. Ahhh I envy your Albom's book! I fell in love with his works since Morrie :)) Looking forward to your review!